Today’s electronics have brought a plethora of new issues to vehicle repair – and that’s putting it mildly. We are no longer just removing dents. Now, we have to look at the big picture. The problem is that the picture is not quite clear yet. We’re still tuning and dialing in all the variables needed to fix the vehicle correctly. These variables are the new processes and procedures that the auto body repair industry is taking a crash course on learning. We’ve spent time learning what these new electronics do and how they work. Many people have taken the wait-and-see approach to learn or evaluate how long this will be an issue. Let’s be honest, though: they’re not going away. We must also admit that vehicles being able to diagnose or calibrate themselves is a long way off in the world of automotive repair. The big picture in our world is that the vehicle must be returned to pre-loss condition. Another factor is that it must be safe or have all safety systems including elective and passive electronics repaired correctly. You can argue many points of this statement, but in court with a jury, these arguments can be costly. The only guidelines any of us have and what we are and will be held accountable for are the OE procedures. The customer is trusting that all parties involved will fix their vehicle correctly. Recommended vs. required does not make a difference to them. The ultimate goal for all of us is a safe and happy customer. Scanning electronics, recalibrating sensors and reprogramming parts is a new part of our world we must adapt to. But there is one more aspect to address: chasing wires. These are the repairs we’ll have to perform when a problem is found or a service requires more than a scan. All these options have advantages and disadvantages depending on each shop’s variables. The scan is going to give you a reading of the operation of the electronics. In short, it will check computers and control modules to verify that they’re talking to each other correctly through the vast array of wires sensors and connections. If any problem is found, a code will be set. These issues will present themselves during a scan. A problem that will not be recognized in the scan process is the recalibration issue. A scan will tell you the system is functional, but it will not tell you if the sensors are aimed correctly. This requires a scan tool and targets to verify the sensors are at the angles to work properly. 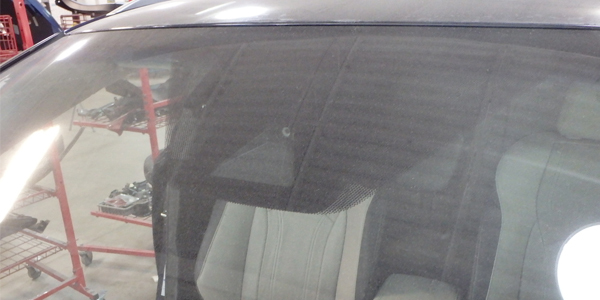 An example would be a vehicle with a damaged taillight pocket. The radar mounted below that pocket must be aimed correctly. In most cases, there are no measurements to tell you where that mounting bracket and angle must be. Sometimes, the only guide you have is doing a comparative measurement to the other side of the vehicle. If this radar is not aimed correctly, then the blind spot system will not perform correctly. This is all part of what I call “chasing wires,” or finding out why I have codes and what must be done to ensure that all aspects of electronics are correct – something a scan currently won’t be able to do. Finding codes is one aspect of the repair; clearing them will make the current code go away. But the uncorrected problem will bring the code right back, making it a reoccurring code or, in trying to clear, the code stays because there is a major problem. All of this happens, yet no light on the dash will occur. This makes that trusty dashlight an unreliable tool for diagnosing a vehicle’s problems. Some of you are now realizing there is a real dilemma with all of these scan and diagnostic processes. Who does all this? Who will chase the wires when a problem is found? The current technician shortage has all of us wondering what’s going to happen in this industry. This is a major problem, and is the elephant in the room that is not talked about enough. Who has the skills to do scans? Who has the skills to chase wires and fix electronics? What is the cost of the process if outsourced? What are the logistics if you’re looking at sending the vehicle to a dealer or bringing in an outside service? How much time will it take to either process in-house or transport the vehicle? What are the logistics of the cycle time process? What is the cost of training and/or equipment? There are even more questions to ask yourself depending on your shop’s variables, such as location to services and staff. You could dedicate one of your employees to scanning as the process is fairly straightforward to learn. Which employee though? That’s the dilemma. 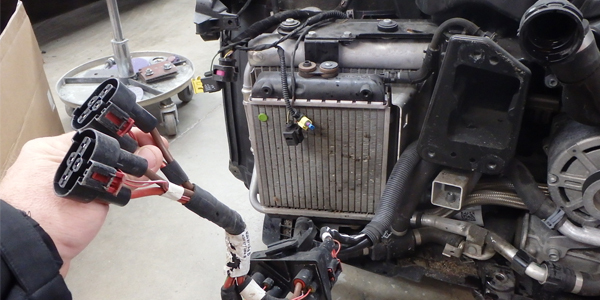 Do you train a technician and use their time doing scans when they could be repairing vehicles? This will definitely change the hands-on time needed to repair body damage. Do you train an estimator? What happens when a scan has problems? Who will now need to diagnose what the code will be telling the shop? Who will be chasing the wires? The skill set needed to chase wires will vary. The days of just throwing parts at a vehicle and hoping the code goes away are gone. When airbags first came out, the industry learned that “throwing parts” was an expensive and ineffective way to repair a vehicle. First, you will need a basic understanding of electronics – knowing how to use a DVOM to measure resistance in wires accurately, and the ability to see and chase shorts or damage in literally miles of wires. Learning to read OE specs and understand flow charts will be a must. You’ll also need to learn OE requirements on wire repair and options as well as routing and power demands and limitations of circuits. If you already have a skilled technician who is proficient in electronics, you’re way ahead of the game. If they’re also a damage repair tech, you may need to face the fact that these electronics will take more and more of their time. Keep in mind, though, that this will create revenue for your shop. The tool box will include scan tools, targets for recalibration and computers for identifying procedures. Training will be a necessity if you decide to do scans and recalibrations in-house vs. hiring dealers or outside services. When you talk to companies who offer these services, you see the cost and equipment. You may not see the training, but it is there. How do you get an adequate ROI or return on investment? In a high-volume shop, you may get the return faster. What about smaller shops? Do you sublet or spend the money and time to do it in-house? I realize this will take some serious thought. Some have realized that chasing wires and recalibration requirements will dictate the evolution of our industry. A good place to see this change is the auto glass industry. Recalibrations required for windshield replacement has companies cross-training technicians to install glass and do the camera recalibrations. Like the auto body industry, the severe shortage of technicians has been an ever-increasing challenge for the glass industry. Reducing the number of glass pieces that can be installed each day reduces the glass revenue. The recalibration does offset the revenue lost, in many cases, but the problem now is that less customers can be serviced per day. Customers are no longer willing to wait to get their windshields replaced and may move on to different companies who can get it done. Like the auto body industry, if you cross-train a glass repair technician, you give up repair labor. Due to glass getting more sophisticated, companies are cross-training techs to install glass and do recalibrations. In many cases, hiring a separate technician or training a person to do the electronics portion of the repairs seems like a more advantageous business model as they do not need auto body experience. This gives us a pool of individuals to choose from or train different from the one we currently have. Having electronics skills or familiarity with computers would be preferred. This is a new train of thought for many businesses, and it also gives us the opportunity to introduce new people to the auto body profession. I see this as a great positive in terms of changing the perception of our industry. No matter what avenue you choose to pursue, you’ll need good, reliable information. I-CAR has been one of the leaders in recognizing shops’ changing needs. Their new training courses and the implementation of the RTS website is a great start to bringing this type of information into a shop. The I-CAR team recognized this need early and acted early. So many shop managers and owners are frustrated at how fast and expensive change and keeping up with the times is becoming, but the I-CAR courses can help you. The changes that are occurring in the industry will bring new revenues and more opportunities to shops. Also, new job descriptions and the ability to possibly change the perception of our industry and draw new people. Looking ahead to the possibilities and the needs of our industry and the consumer makes me wonder what we’ll need to adapt to next. Looking to the future, we have an interesting road ahead. Beware, it will mean bumps and bruises, but that’s the case with any business that is evolving as fast as ours.